Cook specified that the 30 percent statistic applies to customers who upgraded from an Android device, not first-time buyers. He went on to say the switch rate was the largest recorded since Apple began tracking such statistics around three years ago. Reasons for the minor exodus were not explored, but Apple has been aggressively targeting Android users as of late. 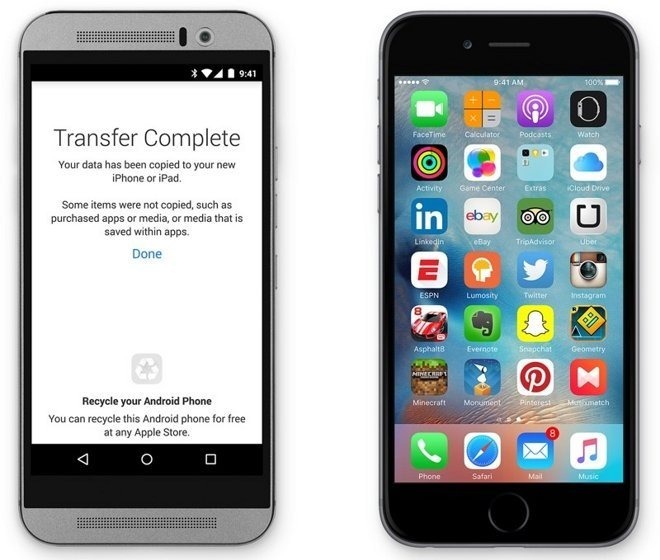 For example, a trade in program launched in March targeted non-iOS devices, while Apple in June announced a dedicated "Move to iOS" app for migrating data from an Android device to iOS. The migration tool went live in the Android App Store last month, just in time for the iPhone 6s. Looking forward, Cook believes an increasing number of Android users are likely to switch once eligible for a carrier upgrade which, when combined with new buyers, should drive strong first quarter 2016 sales. "We have a very open field in front of us," Cook said of next quarter. For the fourth quarter, Apple sold a record 48 million iPhones, a 22 percent year over year boost helped along by a 120 percent increase in Chinese sales.